Drug cartel "queen" Sandra Avila Beltran is alleged to have received Botox injections at a Mexico City prison in January. (CNN) -- Mexican officials have launched an investigation into allegations that a reputed Mexican drug cartel "queen" received a beauty treatment while in prison. The Mexico City District Attorney's Office alleges that Sandra Avila Beltran, who faces charges of drug trafficking, money laundering and conspiracy, got a Botox injection on January 10 at the Santa Martha Acatitla prison in the Mexican capital. Prosecutors said they are investigating medical personnel at the prison who might have provided access to a doctor who applied the Botox injection to Avila, also known as "The Queen of the Pacific." Avila, who according to Mexican media reports is 50 years old, was allegedly tied to the Sinaloa Cartel, one of the most powerful Mexican criminal organizations. Mexico City District Attorney Miguel Angel Mancera said the investigation into the prison incident was prompted by a tip from prison personnel. Mancera also said prison employees who have not yet been identified "falsified" an access request form saying the doctor was going to perform an electrocardiogram, but instead applied the injection. "The investigation will focus on the possibility that a public servant committed a crime, according to the complaint made by the prison authorities," Mancera said. He also said Avila and the prison director will be questioned in the next few days, but he didn't elaborate on what kind of disciplinary action those allegedly involved in the incident may face. So far, the doctor who gained access to the prison -- and who was not identified by authorities -- faces no charges. 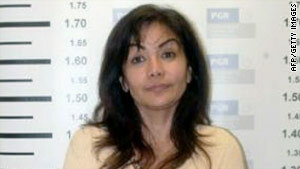 Sandra Avila Beltran was arrested on September 28, 2007, in Mexico City. According to the U.S. Drug Enforcement Administration, she was suspected of conspiring to smuggle cocaine into the U.S. along with Juan Diego Espinosa, a.k.a. "The Tiger," a Colombian national who, sources say, was his lover. They were arrested together. The DEA said that in November 2001, Espinosa, Avila and others "allegedly arranged the shipment of cocaine from Colombia to the United States by ship." The ship, loaded with 9,291 kilograms of cocaine, was boarded by U.S. agents near Manzanillo, on Mexico's Pacific coast. Avila's fame grew in Mexico and Latin America after inspiring a song by the popular Mexican folk band known as "Los Tigres del Norte" (The Northern Tigers).